The Consumer Electronics Show is now in full swing in Las Vegas, and Razer is back at it again. Every year at CES, Razer has continues to surprise everyone over and over again, and this year, it’s no exception. From yet another prototype device, to an updated line of gaming peripherals that will be released later this year, let’s look at everything that Razer has taken the wraps off at CES 2018. First up on the list is Razer’s new partnership with Dutch electronics giant Philips. 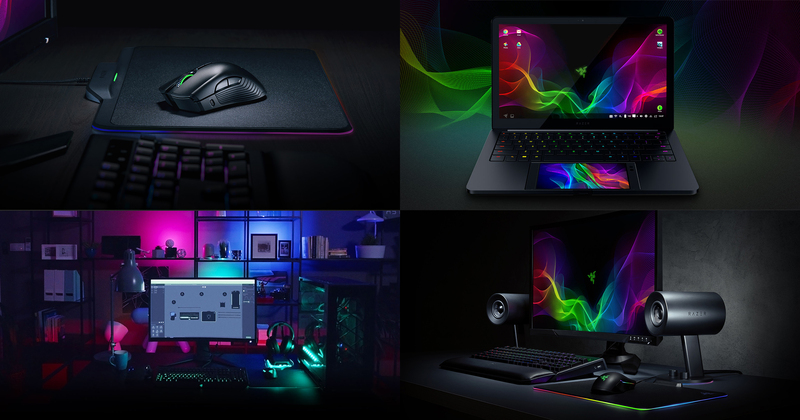 Not contented with just lighting up the desks of gamers with over 16 million colour combinations through mice, keyboards, headphones, stands, and mats, Razer now wants to extend Chroma into your home with the integration of the Philips Hue lighting system. Through the Synapse 3 software, you can control compatible Philips Hue lighting fixtures in and around your home in what Razer calls the Chroma Studio. This means that if you are already using Chroma peripherals and have Philips Hue bulbs in your room, you can sync them up immediately. Watch as not only your gaming peripherals, but also your room, react to games and music that’s being played on your computer. In my review of the Razer Phone, I said that the device was as if the Razer Blade was shrunken into the form factor of a mobile phone. Well guess what? Razer just unveiled a special prototype that will turn your phone into a laptop. At first, Project Linda looks like Razer’s ultrabook line of laptops, the Blade Stealth, that is until you look at the area where a trackpad will traditionally reside. In its place is a gaping hole for you to dock a Razer Phone, turning it into a trackpad while powering the entire laptop. What Razer has done is turn their phone into a Chromebook. After the Razer Phone is docked, you will get an extended Android interface on the laptop. The phone will then double as a trackpad, as well as a secondary display where supported in apps and games. While the idea for this kind of implementation isn’t new, Razer is the first one to come up with a working prototype, and by the looks of it, I won’t be surprised if it goes into mass production like some of their older ‘projects’. Weird name and puns aside, Razer finally updated their speaker portfolio. The age old Leviathan was getting dated, and the introduction of the Nommo speakers are timely. Gone is the soundbar aesthetics as Razer has gone back to the traditional 2.0 or 5.1 speakers setup, depending on which version of the Nommo you get. They might also have scored another winner too. Reviews from visitors to the Razer suite have all been positive with them being impressed by the sound quality, and the varying price points of the Nommo. The highest end of the bunch, the Nommo Pro features an additional subwoofer for that extra oomph, as well as THX certification, so you know you’ll be getting cinematic sound. The Nommo will cost S$160, Nommo Chroma S$230. The soon to be released Nommo Pro has no local pricing yet, but in the US it will run about US$500. Lastly, what’s a Razer announcement without a new mouse? The Mamba has been updated to go head-on with rivals whom have gone for a truly wireless gaming mouse experience via a connected mousepad. The new Mamba is used in conjunction with the updated Firefly mousepad which now has an inbuilt receiver and charging coil to power the mouse. Razer dubbed this its Hyperflux Wireless Power Technology. Unlike competitors, the new Mamba does not have a battery in it. Instead, it relies on the power generated by the Firefly to keep itself in an always-on state. If the Mamba is away from the Firefly for a few seconds, it will automatically power off until it is placed on the mat again. Alternatively, you can still connect a micro USB cable to use it in wired mode. The cost to go into a wireless future? S$400. The last big announcement from the Razer team is a feature update for the Razer Phone. We all know about the prowess of the Razer Phone as the ultimate device for mobile entertainment, with a fantastic 120Hz display and a best in class front facing stereo speakers. Razer has taken that a step further by partnering with Netflix that brings HDR and Dolby Digital 5.1 when you stream videos from the platform. 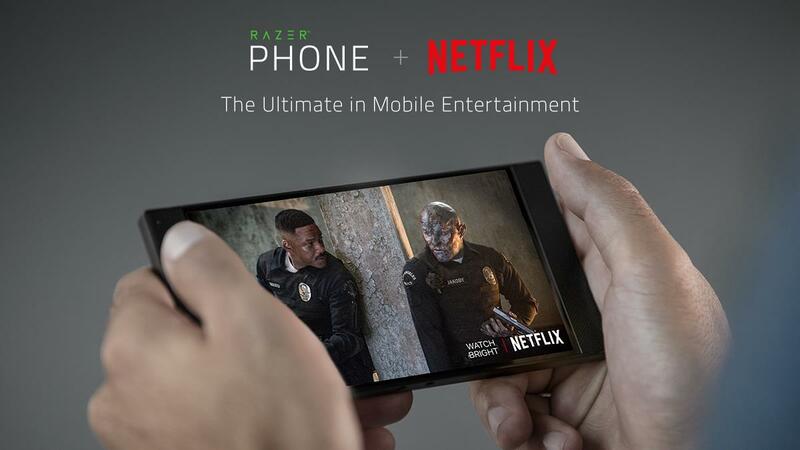 This makes the Razer Phone the first in the smartphone arena to have the ability to support premium audio and video formats on Netflix. As usual, these announcements are but a taste of what’s to come for the rest of the year by Razer. We’re expecting updates to the Razer Blade and Blade Pro with Intel’s latest processors, and also for Hyperflux to make its way into more peripherals. Have those kidneys ready. You may want to exercise that payment option for all of Razer’s latest products.